Microsoft's Xbox Music service is about to leave that cosy Redmond nest and take on the world, the company has confirmed. , but that will all change next week with the arrival of a web-based version. The Music.Xbox.com site is currently being prepared for launch and Microsoft has promised us more details will come after the weekend. 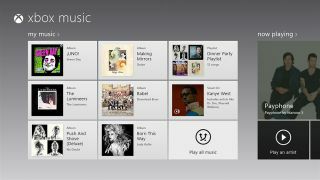 After reports from The Verge claimed the launch was imminent, a Microsoft spokesperson told TechRadar: "Yes, a web version for Xbox Music will launch next week. We will have more details to share then." The launch will turn Xbox Music into the latest Spotify contender, giving it a high-profile, recognisable presence beyond devices running Microsoft's software. The web-based launch, according to The Verge, will also make the platform available on Android and iOS devices, although whether that also results in standalone apps remains to be seen. It's possible that we'll learn more about the plans at Build 2013, which starts tomorrow. The app is also rumoured to be getting a design refresh when Microsoft outlines the Windows 8.1 update as the company's annual developer-focused event gets started tomorrow.